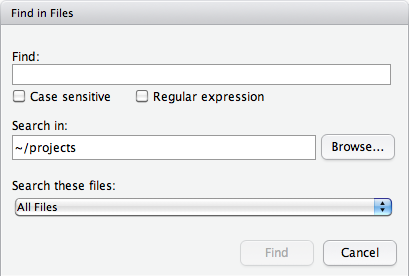 RStudio includes a number of features to enable rapid navigation through R source code. Learning these features can be a major productivity enhancement and can also assist in gaining a better understanding of source code written by others on your team or within external packages. If an RStudio Project is active then all R source files within the project directory are indexed. If a Project is not active then all currently open R source files are indexed. The keyboard shortcut for Go to File/Function is Ctrl+. It is possible to navigate to both your own functions (defined in R source files) as well as any other function defined within an R package. For functions defined within packages the code is displayed in a special Source Viewer pane which is read-only. The go to function definition feature described above also works for functions within the current source file (giving precedence to functions defined within the calling scope). The Jump to Line command can be used to go to any line in the current file. Keyboard shortcut: Alt+Shift+G (Mac: Option+Shift+Cmd+G). You can also use the function menu (shown below) to quickly jump to functions by name. Note that the function menu currently supports standard R functions however does not yet support S4 methods. When navigating through code (especially when navigating through a sequence of function calls) you often want to quickly return to the previous editing location. RStudio maintains a list of active navigations and allows you to traverse them using the Back and Forward commands (available on the Edit menu and on the far left of the source editor toolbar). You can also invoke Back and Forward using the Ctrl+F9/Ctrl+F10 (Cmd+F9/Cmd+F10 on the Mac) keyboard shortcuts.